This article appeared in Sacred Web 5. To order this issue of Sacred Web and other back issues, click here. The saint is effectively the void made for the passage of God. It is a curious fact of modern lives, particularly in urban societies, that people are increasingly hard-edged and jaded, burying their vulnerabilities deep within an exterior of toughness and resignation. Their detachment renders them capable of gazing vacantly at images of violence and depravity or of shrugging indifferently at news of war, famine or disaster. For them, in the words of Tennessee Williams, "happiness is insensitivity". This insensitivity - the detachment of modernity - is very different to the quality of detachment advocated by tradition as a virtue. It is not a detachment of compassion and serenity, rather a paradoxical amalgam of unconcern and craving. The detachment of tradition, by contrast, is grounded in humane compassion, not in insensitivity. The basis for this detachment is a view of reality as both transcendent (hence the distance of detachment) and immanent (hence the intimacy of compassion). The acceptance of transcendence necessarily imparts a recognition of our own indigence and contingency in relation to the Absolute, producing a sense of wonder and humility that are all but lacking in the modern outlook. At the same time, the acceptance of immanence imparts an awareness of the integrity of reality, producing a sense of its sacred inter-relatedness and an abiding compassion for all things that is the very antithesis of insensitivity. It is, from the traditional point of view, fundamentally erroneous either to lose sight of our essential connectedness or to attempt to locate it outside transcendence and the integrity of reality. This is a principal error of modernity. By this, it is not suggested that to live in the contemporary world is necessarily to deny transcendence - merely that the denial of transcendence is a defining feature of the modern ethos - an ethos that has been labeled by contemporary commentators variously as narcissistic and apathetic. This denial, where it exists, lies at the root of modern humanity’s conflation of compassion and passion, of joy and pleasure, of depth and intensity. And it is the cause of humankind’s abstraction of virtue into empty forms and gestures, and its relativization into privatized morality or self-indulgent excesses of sentimentality. The idea of loving one’s neighbor is possible only as an abstraction: it may be conceivable to love one’s fellow man at a distance, but it is almost never possible to love him at close quarters. How easy it is to love in the abstract! And how much more demanding it is to actualize the needs of love in the concrete context of our relationships and the exigencies of daily living! It is helpful to remember that in Christianity, the commandment to "love thy neighbor as thyself" is subordinate to "the first and great commandment": to "love the Lord thy God with all thy heart, and with all thy soul, and with all thy mind." It is Principle that informs Process. It is the vertical relationship of man and God that gives meaning to all creaturely relationships on the horizontal plane. Humanity’s love for the creatures of God is therefore grounded in the transcendental affirmation of humanity’s love of God. This is not an abstract love, but a love that is animated, imbued with the presence of life. It is only by witnessing the spiritual basis of all creation that humanity can discover the criterion for the love of itself - not narcissistically but selflessly (i.e. loving the neighbor as oneself). It is helpful, perhaps, to recall, that, based on its etymology and in its traditional usage, the word "theoretical" (derived from the Greek theoria, suggesting "vision") does not signify an abstraction, as its modern usage implies, but rather imparts the sense of "presence" or an "envisioning" of reality. This is one of the reasons why traditional sages are often referred to as "seers". What distinguishes their perception from that of the common man is precisely their ability to "see" beyond the "veil" of metaphysical transparency - to perceive the transcendent dimension and its pervasive manifestation in all things. This is why, in Vedantic terms, ayam atma brahma ("The Atman is the Brahman") - in other words, immanence is, paradoxically, an aspect of transcendence. It is interesting to note how the modern usage of the word "theoretical" suggests a distancing - or abstraction - of reality, hence of God (or supra-formal, spiritual reality) and, a fortiori, of the self (the divine or spiritual imprint within each human being), devaluing these terms and reducing them to their peripheral meanings. Evidence of such a reduction is also apparent by contrasting the different outlooks of the traditional and modern worlds regarding the term "humanism". Following Jacques Maritain, one can distinguish between two forms of humanism: the traditional (l’humanisme integral), which is premised on spiritual reality (or God) as the center of human existence, and the modern, which views human beings as their own center and the center of all things. 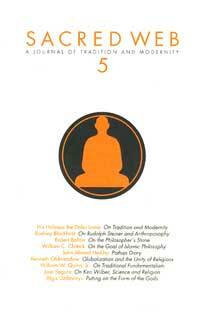 Traditional humanism, then, is a form of spiritual courtesy which is more than mere social or religious convention. In Islam, for example, the Arabic term for "humanism", adab, is usually translated as "courtesy". Adab signifies the manifestation of ihsan, that is to say, intrinsic beauty, projected in the sincere virtuous conduct (spiritual courtesy) of the individual, or in a culture and ethos of spiritual (or theocentric) humanism. It is an attitude of attention to the inner qualities which exist within all human beings as marks of their spiritual Origin. It is also an inner sensitivity to the divine image within each of us and a specific awareness of that spiritual Presence residing within each individual, no matter how faint or weak. By contrast, in the case of modern (or anthropocentric) humanism, the ignored human soul - because it perforce must demand order - produces merely the counterfeit of adab in the forms of societal norms of civility, privatized morality, and procedurally-regulated "values" or codes of behavior. These are not the transforming virtue of tradition "which wounds our nature as the plough wounds the soil" (Schuon), but mere - often conscienceless - pragmatism. The distancing or abstraction that marks the detachment (a better term might be dis-connectedness or apathy) of modernity is none other than our ontological distance from our spiritual Source - and therefore, in traditional metaphysics, also from our own humanity and our rightful place in the cosmos. It is this ontological distance that religion seeks to bridge, reconnecting us to our Center and Origin - as is evident from the etymology of the term "religion" (derived from the Latin root, ligare, signifying a binding). True adab, on the part of human beings, is a matter of orientation. In traditional societies, human beings are oriented - both in intellect and will - towards the Source of Illumination, that is to say, theocentrically. It is helpful to note that the Orient (from which the term "orientation" is derived) is the source of the physical light of the Sun - a felicitous metaphor for the discerning intellect. It is only by correctly orienting ourselves that we can begin to efface the darkness of our ignorance and lassitude and begin to reconnect with the Light that radiates in all beings. In the words of Niffari: "You will not come out from your veil except through my Light". The detachment of tradition, then, is the voiding of all that is human in order to merit the grace of reconnecting with our spiritual center - the Light that transcends metaphor. It is this Light of compassionate serenity that constitutes the core of our very being, radiating within us as true adab, genuine spiritual courtesy, and within humankind as the traditional humanism that can be our only salvation.